Security Master is Cheetah Mobile’s most popular app on the Google Play Store. It is a free application with a massive user base of 500 million. The app reached a milestone figure of 100+ Mn users within a year of its launch. According to AV-test, the SM’s antivirus engine has a remarkable threat-detection rate of 100%. The app’s setup file size is 15 megabytes. It has a modern navy blue themed UI that flaunts a menu bar and a bottom navigation. Users don’t have to register an account to use Security Master. The Security Master app ships with an intelligent diagnostic tool that scans your phone to identify threats and issues that are affecting its performance. When I opened the app on my Android device, it ran a quick scan operation. SM took about 8 seconds to scan my phone. The only security issue SM found on my device was that I didn’t enable its real-time protection feature. SM labels issues it has identified as threats. Once it finishes scanning your mobile device, the security app will display a “Remove All” button. Tap on this button to clear the warning messages and eliminate the viruses SM has found on your phone. Like other security applications, this app supports the full system scan operation. I have installed many apps and games on my phone. I have also downloaded tons of files from various websites. Security Master took 40 to 50 seconds to scan the entire file system. Security Master can stop unauthorized users from reading your notifications. When you turn on this feature, the app will display a two-column interface. The 1st column features a list of apps and the 2nd column displays a list of checkboxes. To mask the notifications from specific apps, select the applications from the list and tap on the “OK” button. Security Master app has a function called Charge Master that displays the battery charging status and the apps that are wasting the battery power on the lock screen. 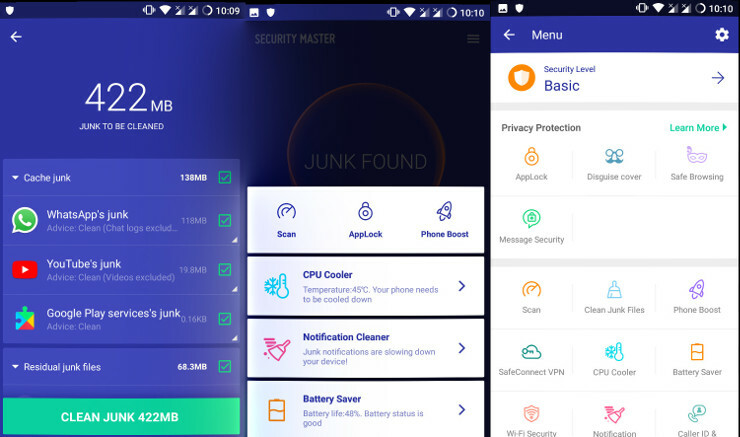 The Cheetah Mobile security application can clean junk notifications on your phone. It can also find and delete unwanted files from the phone’s storage memory. CM Security Master has a built-in VPN called SafeConnect. When you enable SafeConnect, the app will encrypt the outgoing network traffic. Users can transfer 200 MB data with SafeConnect. Like other top VPN apps, SM allows users to change the server location. SafeConnect VPN makes users aware of the amount of data they have transferred, IP address of the server, and the duration for which the VPN connection was active. Network Analyzer module of Security Master lets users check their internet connection speed. It also scans the WiFi connection and marks it as “Safe” or “Unsafe”. The app monitors the network connection to calculate the average download, upload, and WiFi speed. It displays the Encryption protocol the router or hotspot has employed. If you’re not using an unlimited data connection, Security Master can help you save data by removing the apps that are using the internet bandwidth. The processor in the mobile phone will be busy if you run too many apps at a time. If the processor is in use for a long time, it will become hot. The CPU cooler utility of this application will cool down the processor. To do so, it will prompt you to close the running apps that you’re not using. Battery Saver is one of the top features of Security Master. Instead of killing apps abruptly, you can configure SM to hibernate the apps which you don’t use often. The app has an inbuilt web browser. You can prevent users from accessing the browser by setting a password or pattern lock. Users can configure SM to erase the browsing history, cookies, sessions when they close the browser. The browser supports private browsing. It has the option to disable images, change text size and enable night mode. It includes a Photo/Video vault where you can save the downloaded videos, images, etc. Security Master provides an option to update the virus definitions. Updating the virus DB will help SM in identifying the latest threats on the mobile device. The SM app allows you to block calls from telemarketers, scammers, etc. It also makes you aware of the name and location of an unnamed caller. The settings panel of the Security Master app provides an option to schedule a scan, enable or disable real-time scanning, add apps to ignore list, turn off automatic virus definition updates, etc. 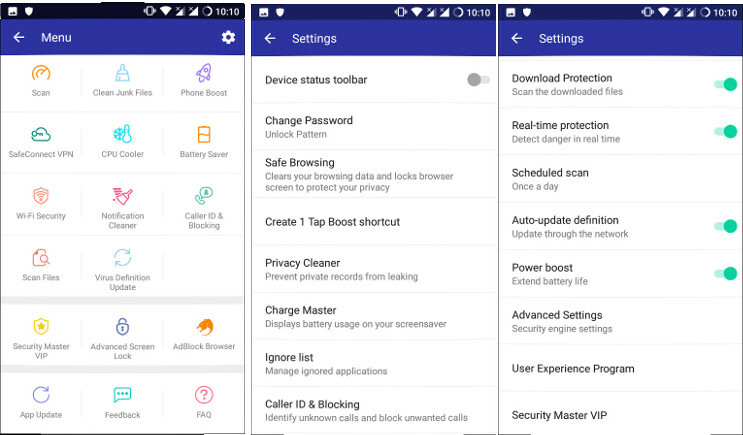 Cheetah mobile's security app has 10+ features. It can protect your messages, files, etc. Security Master's has a powerful AV engine which can scan files on demand of the user. Had Security Master on my new cell phone. Terrible program. Yea if runs security, clears space but it blocks all notifications (messages, EMails) coming into your cell phone.